Illustrating examples of structural, morphological and physiological adaptations which are influenced by environment. The ability to adapt to environment was a key factor in early land plant survival, as well as their spread into less-hospitable areas. We explore and highlight some of these factors, and illustrate these, using examples of some simple and complex ways in which plants have successfully adapted to their environments. A number of concept checks have been included as well, which will point to issues that you should explore in detail, and research specifically for issues relating to successful plant adaptation to environment. Use the concept checks to provide a sound guideline for self-study. Adapt to immediate environmental conditions (water availability, light intensity and temperature). Compete for space by developing climbing, rooting system, synthesis or storage capacity for example. Look up what is meant by the terms hydromorphy, mesomorphy and xeromorphy. Adaptations usually appear as a result of a number of pressures – chief of these pressures is the environment which the plant occupies. Gradual change in the environment, will exert effects on the organism and will result in change, with time. The prime mechanism is by 'selection' of plants with slight genetic variations that make them more suited to the environment. These variations may be passed on to the next generation. For example – access to light is important as plants will grow towards light. It follows that fast climbers will get closer to the light and will thus be able to out compete their neighbours more easily. Climbing imposes other structural requirements. It is important to understand that changes which we see, can be as a result of a relatively simple or complex process. Often, what appears to be simple, is in fact a very complex process, involving changes in the structure of the organ, as well as its physiology as well. Plants are exposed to the atmosphere, and the leaf is the primary exposure site. Leaves are usually exposed to direct solar radiation whist performing their functions of gas exchange, transpiration and carbon assimilation. Leaf form and function will reflect the environment that the plant lives in, and has hopefully become adapted to. 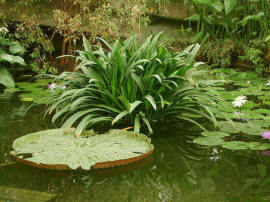 Plants, and particularly leaves, are well-protected from the immediate environment by an epidermis. The upper epidermis of leaves is usually composed of larger cells, with a thicker cuticle, often (but not always) with fewer or no stomata. Many species have hairy leaves, which are in some cases, more prevalent in juvenile than adult leaf forms, such as in Oldenburgia/a> grandis illustrated below. In others, the hairs may be shed as the leaf matures. Sometimes hairs absorb water from the atmosphere, particularly in epiphytes, for example Tillandsia. In some high alpines, e.g. tropical Senecio species, hairs provide an insulating 'blanket' against the cold, so hairiness is not always an indicator of xeromorphy. Debilitative stress is thus decreased during the important early growth phase. Close up of the apical region of an Oldenburgia shoot apex. The image to the left shows part of the apical region an Oldenburgia grandis plant. 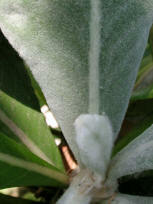 Note that the most recently-produced leaves are covered in fine silky hairs. These hairs serve several important functions. 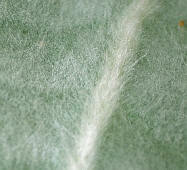 A dense meshwork of fine silky hairs covers both adaxial and abaxial leaf surfaces (right). 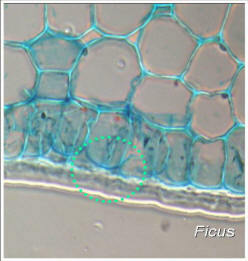 This image to the right is a close up of the lower epidermis, and shows part of the midrib and lamina of a young leaf. All leaves contain photosynthetic tissues, called the mesophyll. The mesophyll is simple in many species, but in the dicotyledons, it may be divided into palisade and spongy mesophyll layers. Most leaves are distinctly bifacial, others are unifacial. All leaves are supplied with a vascular system – this may be very varied, but always contain xylem and phloem. An example of an extreme variation can be found in hydrophytes - those plants that live in a watery niche. The micrograph to the left, shows a small vascular bundle in the petiole of Nymphaea, the water lily. Notice how the xylem (water conducting tissue) is reduced to two xylem elements, both of which are lignified. The smaller one is a protoxylem element, and the larger is a metaxylem element. 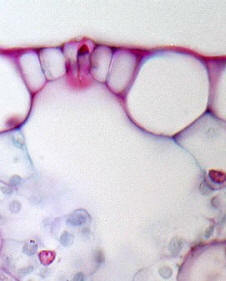 Large sieve tubes and smaller companion cells are visible above the xylem. This is a good example of a plant that has reduced xylem capacity. Transpiration is necessary, but the other function that cannot be neglected, is the passive uptake and redistribution of ions from the root system. The loss of water has to be balanced and regulated during gas exchange. 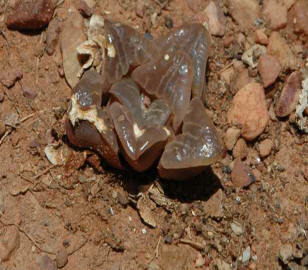 Dry xeric conditions pose severe problems in terms of survival, and many adaptations have evolved to ensure a better than average chance of survival. Cuticular thickening adds to the impermeable layer which interfaces the epidermal and sub epidermal cells with the surrounding air. Light and heat reflection are also important functions of surface wax, particularly when the wax crystals are prominent, such as upright flakes, and give a white sheen to the leaf surface. Leaf anatomy provides a great deal of information about the habitat occupied by the species in question. In most cases, the main function of the leaf is photosynthesis. 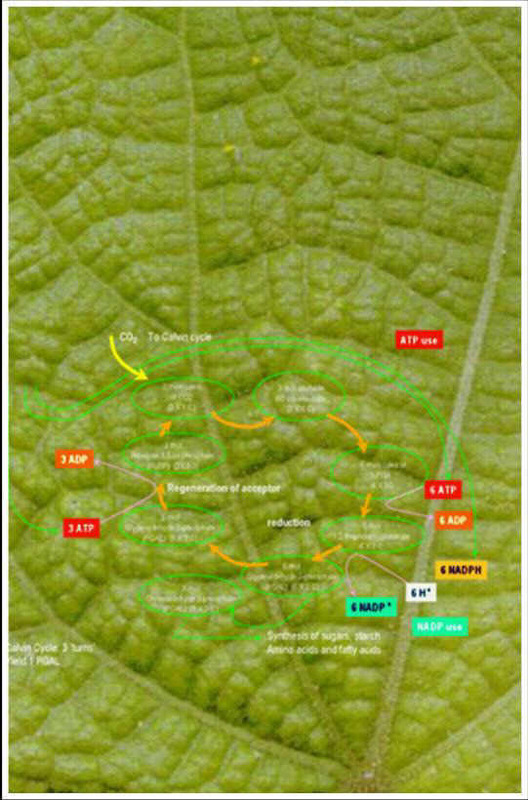 This process is carried out by chloroplasts within the mesophyll cells of the leaf. Protection from the environment is offered by modifications to the epidermis such as thickened cuticles and sunken stomata. It is important to note that not all leaves contain chloroplasts; some parasites have brown or white leaves and depend on their host for a supply of photoassimated carbon. Sunken stomata are particularly important where plants occupy dry or xeric ecological niches. This adaptation is illustrated here in Hakea (left) and in In Crassula (right). In Hakea, the stomates lie in the same plane as the palisade mesophyll and are protected from direct exposure to the air by enlarged epidermal cells, which have very thick outer tangential walls. 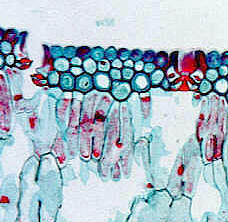 In Crassula, (above right) the large epidermal cells play an important role in regulating water loss. When the large epidermal cells are fully hydrated as shown here, there are gaps between them which allow gas exchange. When dehydrated, the cells collapse, closing the airways to the stomata. Pine species (right) are also associated with sunken stomata. In the detail of the pine needle to the left the guard cells are carried beneath the subsidiary cells. Note the thickened epidermis, which may also become lignified in mature needles. The underlying intercellular air spaces are compact. These are typical modifications associated with xerophyte leaves. Thickened cuticles like that of Ficus (the fig) shown in the dotted circles in the images to the right, do not allow passage of large volumes of water vapour, and they also limit CO2 andO2 exchange as well! The mesophyll of many species mesophyll tissues are compact, and may be associated with an hypodermis. This is considered to be a xerophytic characteristic. The question is, is the fig a xerophyte or not? Explore this further and make up your own mind. Stoma are the principal structures through which water is lost from leaves, through the process of transpiration. Transpiration occurs at the same time as carbon dioxide and oxygen gas is exchanged, during photosynthesis and respiration. Many leaves have stomata in one epidermis only, and are termed hypostomatous. If stomata occur on both sides of the leaf, the stomatal distribution is amphistomatous. Amphistomatous plants can transpire and loose water from both sides of the leaf, whilst hypostomatous plants loose water only on one side of the leaf. This does not mean that all xerophytes are hypostomatous, or that that they all have stomates tucked under the lower epidermis! Limiting damage means that the plant conserves its structure, as well as carbon resources used in the construction process. The rose thorns shown at right, are an ideal defence mechanism which deter browsing. 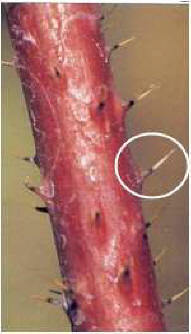 These thorns are really modified epidermal cells and are more correctly termed 'prickles'. 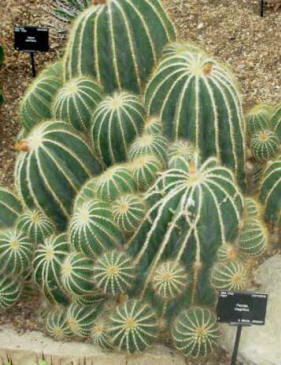 The cactus as an example of a really spiny plant! Tendrils and spines are the most effective systems. 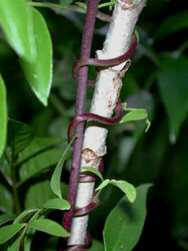 Tendrils are used to twine round solid objects, thus providing a means of support for the plant. Some plants have twining stem tendrils (e.g. grape). Some have true leaf tendrils (e.g. sweet pea) In others, (e.g. Lathyrus as well as other members of the Fabaceae, Passiflora, and the Bignonia (Trumpet flower), in which the leaf tendrils are modified leaflets of compound leaves. Growth and survival in deserts is more difficult. Desert plants, especially succulents, have built-in protection, usually in the form of spines, or teeth, which effectively discourage predators. Tendril climbing is a very efficient mode of ascending into a low canopy, because tendrils may grow laterally from a vertical main stem, thereby minimizing amount of stem tissue necessary for climbing. However, even though tendrils have developed specifically for grasping structures, they are relatively weak and often do not have adequate mechanical support for heavy structures such as lianas climbing high into a forest canopy. Tendril climbers are most common in open disturbed habitats or remaining in full-sun environments atop host species and moving between host individuals efficiently. 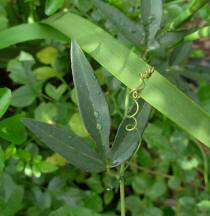 The Passiflora leaf shown here, develops modified leaf tendrils. Unlike a leaf however, these tendrils do not stop growing. Notice the coiled, spring-like morphology assumed by the tendril, (arrow) when it attaches to a host. Host attachment can be effected fairly quickly. The coil acts as a shock absorber. The image to the left, shows a modified leaf tendril of the Bignon, Phaedranthus buccinatorius has bound the thin purple stem of this climber to a Tecomaria stem. The typical Bignon liana (Family Bignoniaceae) has a compound leaf in which the terminal leaflet can differentiate as a tendril, forming a leaflet tendril. 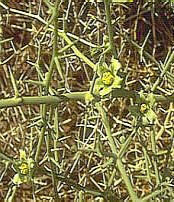 Lycium is an example of a stem in which lateral branches become modified into sharp, hard, sclerophyllous spines. These spines protect the leaves from predators. The terms ‘spine’ and ‘thorn’ are used synonymously but most spines are modified leaves, arising from beneath the epidermis. Although all plants will store water, succulents are especially well-adapted to water storage. Succulent plants are especially well-adapted to long-terms water storage within their leaves or stems. Many succulents have a waxy coating on their stems and leaves, thereby reducing water loss and helping them to retain moisture. The ratio between internal volume and surface area is important in successful water retention. A large internal storage volume, coupled with a reduced area also helps prevent water loss. Succulence is is thus an expression of adaptation to a dry climate, and all these successfully-adapted plants are called xerophytes. Thick waxy cuticles, sunken stomata, reduced leaf area, are key elements to look for in identifying xerophytes. One other factor of great significance is that nearly all succulents follow CAM or Crassulacean acid metabolism and take up CO2 at night, when water loss can be reduced to an extremely low level. CO2 is stored in vacuoles as malic acid. During the day, the malic acid is broken down to pyruvic acid, is phosphorylated to phosphoenol pyruvate and utilized in the C3 photosynthetic cycle. In desert plants, maintaining a favourable leaf surface to volume ratio is critical. The greater the surface area, the higher the loss of water through transpiration. Total leaf volume controls the amount of water available, a large surface area, with a small volume, will allow rapid wilting. A large volume with a small surface area is highly conservative against water loss. 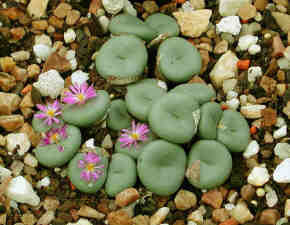 Some members of the Aizoaceae, such as Fenestraria rhopalophylla (below, left), has transparent leaf tips, thus exposing only the ends of its succulent leaves as windows to sunlight, whilst maintaining a minimum area of exposure – this decreases water loss. Conophylum minuium shown above, is another member of the Aizoaceae that has highly reduced fleshy leaves, exposing a minimum surface area to the environment, thereby minimizing water loss. Like Fenestraria (above), Haworthia retusa --a member of the Liliaceae (Asphodelaceae) or Star Cactus -- shown to the right, is a native of the Cape Province of South Africa. The leaves of this plant form a rosette of small, stubby, deltoid-shaped leaves, which can grow up to 5 cm in length. Individual plants reach up to 4 inches (10 cm) across. 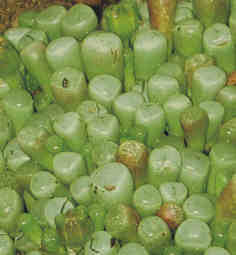 The terminal area of the leaves is translucent. These translucent windows allow sunlight to reach the interior of the leaves, thereby exposing the photosynthetic areas within the leaves. the translucent windows that illuminate the interior photosynthetic areas of the leaves. These are called "window leaves" and represent a xerophytic adaptation. There is evidence that anthropogenic global warming could "significantly exceed" their thermal thresholds. The Cactus, Parodia magnifica (left) is an example of a spiny succulent. These plants occupy harsh environments - where low rainfall or low water availability are the common denominator in the distribution. They occur in South America and can be found in dry areas, but can be found in many habitats (temperate, sub-tropical, and tropical), ranging from deserts to tropical rainforests and in the Andes Mountains. Many of the cacti have very long, fibrous roots, which find and absorb moisture from the soil. Some, like ball cactus illustrated here, have shorter, more compact roots that absorb dew water that falls off the cactus. Amongst Cactaceae, many are CAM (Crassulacean acid metabolism) types, but others are C3 or C4 photosynthesisers. Cacti mostly have spines or scales instead of leaves (look at the Namib desert nara illustrated here as well). 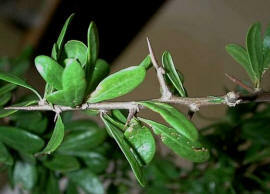 Spines are modified leaves. These spines and scales do not lose water through evaporation as would be the case with normal leaves, which can, depending on their environment, lose a lot of water. The spines also serve a second, important function, as they protect the cactus from predators. The clusters of spines are described as areolar (clustered). Areoles are circular clusters of spines on a cactus. 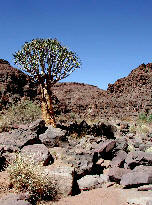 The quiver tree of Namibia, (Aloe dichotoma) illustrated to the right, grows on rocky outcrops - this one near the bottom of the Fish River Canyon, is routinely exposed to very high light and extreme drought, Temperature may range from frost conditions at night, to +45oC during the day. Like all succulents it copes with life in areas of erratic and little rainfall, by storing water in its succulent leaves. The species was discovered in about 1685, during an expedition to Namaqualand in search of copper. The spiny plant Acanthosicyos horridus (The Namib Nara, right) is an example of an extreme xerophyte, that grows on the sand dunes of Namibia. This plant is related to the watermelon (Cucurbit). Its fruits are highly prized as is the plant in the Nama communities within which it grows. This desert plant has photosynthetic spines, no leaves and deeply-furrowed stems. Stomates occur within the furrows, so transpirational water loss is limited. 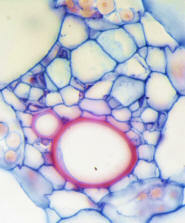 The stem of the Nara contains tightly-packed mesophyll cells, (left) which have only a few small intercellular spaces. 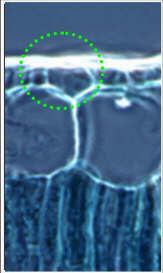 The cortex is separated from the stele, by a band of sclerenchymatous fibers, which form a ring around the more deeply-seated vascular bundles. The fibers have few spaces between them, and will limit exchange of assimilates and water across this interface. The fibers also form an important structural component, supporting the otherwise 'soft' stem structure. 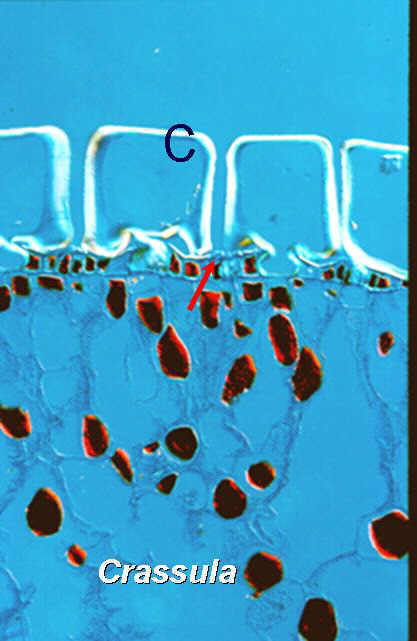 Others, like the Ammophila leaf, have lignified guard cells, with small substomatal cavities (s). The lips of the guard cells close tightly, thus preventing or at least, reducing water loss. The Snow Gum (Eucalyptus pauciflora) is a good example of a species that has adapted to growth at high altitude. It is a small tree or large shrub, one of the mallee group of the Australian genus Eucalyptus. The mallee are eucalyptus species that can produce multiple stems which may propagate through coppice re-sprouting from lignotubers. The snow gum It is usually found in the subalpine habitats of eastern Australia. They grow in varied habitats - from lowlands, where they reach 20 metres, to short, stunted growth forms, such as the example illustrated to the right, at about 2.5 meters, growing near the upper limit of the tree line in Mount Kosciusko State Park in New South Wales, Australia. Lowland Snow Gum is sometimes known as White Sallee, Cabbage Gum or Cabbage Ash. The bark of the snow gum is relatively thick; it serves a protective function. It is varied in colour, from a whitish grey through an red to ochre colour. The bark typically shreds in patches, giving a mottled look. The boreal forest (Russian = taiga) exists as a nearly continuous belt of coniferous trees across North America and Eurasia. They exist in previously glaciated areas, as well as in areas of patchy permafrost. The forests are sensitive to climatic conditions and are composed of a mosaic of successional and subclimax plant communities. In Sweden for example, Scots pine (Pinus sylvestrus) and Norway spruce (Picea abies) dominated the forests, which are now managed to effectively preserve the forest biodiversity. 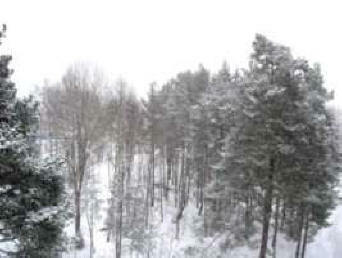 A stand of pines and spruce, near Flemingsburg, Sweden at -12oC. Under these conditions, water is unavailable and the plants are under extreme water and temperature stress. Hydrophytes grow in complex environments. Their upper surfaces, such as is the case in floating leaves, are continually exposed to high solar radiation, thus transpiration rates will of necessity, be very high to maintain evaporative cooling of the exposed leaf tissues. The salt water environment is hostile to many higher plants, and very few have managed to occupy this intertidal niche (mangal) , as well as have mangroves. 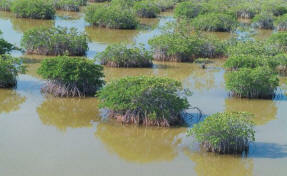 The mangal describes the habitats which mangroves occupy. These are entirely subtropical and tropical and tidal. The soil environments are continuously water-logged and saline or of variable salinity. Mangroves are tropical species, which do not develop well in regions where the average temperature is less than approximately 20oC. They appear to be limited at the upper level to about 40oC. Mangroves cover large areas of shoreline in the tropics and subtropics where they are critical to productivity as well as to the integrity of the ecosystems they occupy. The highest species diversity occurs in Australasia. Many have roots that grow in saline water, often forming stilt roots in an anoxic environment (environment contains no dissolved oxygen). Shoots provide O2 to roots. Recent research shows that air is taken up in cork warts on the adaxial leaf surfaces in Rhizophora. An interconnected aerenchyma system delivers O2 to actively growing regions of roots.CO2 follows the reverse pathway. Limited fresh water means that water loss through the day is minimised by stomatal control and leaf orientation. See Evans et al. (2005) The J. Torrey Bot. Soc.132: (4) 537–550. Images marked 'SFWMD' were kindly provided by Pat Lynch, of the South Florida Water Management District. Image marked 'DWS' from New York Botanical Garden. This interesting group of trees which have a unique method of survival. Strangler fig seeds are dropped by birds, and if this is in the axis of another tree, the seed will germinate in accumulated leaf litter. 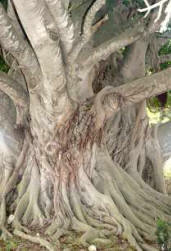 The fig sapling develops roots rapidly down the trunk of the host tree until reaching the ground. Thereafter the will grow aggressively and strangle its host. With time, the host dies, and the fig occupies its space. 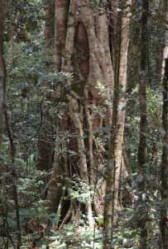 Watson's Fig Ficus watkinsiana) growing in the Cunningham's Gap forests in Queensland Australia, and the Fig species (right, possibly Ficus thonningii) growing in the De Hoop Nature Reserve in the Western Cape, South Africa, each are more than 5 meters in cross section . Not having roots in soil, requires rather specialized adaptations, in physiology - especially of nutrient and water uptake. This group of plants are commonly called 'air plants' and are often epiphytic. Air plants include epiphytes, orchids, lichens, and some species of ferns and cacti. These plants literally obtain moisture and nutrient 'from the air', via highly specialized aerial roots. 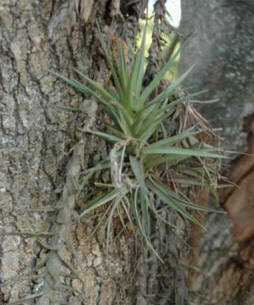 The image to the right is of Tillandsia tenuifolia attached to the bark of its host tree. Notice that the leaves are associated only with the younger, growing parts of the stems. Below this, leaves die off, become hardened as they dry out, and assist in holding onto the host. Given the harsh environmental niche that it occupies, it is not surprising that Tillandsia is a CAM photosynthesizer. Can you think of an example of a bromeliad that is grown for human consumption? In some plants, such as in Kalanchoe pinnata = Bryophyllum pinnatum) shown to the right, the leaves are notched along their margins. A special (marginal) meristem develops at the base of the leaf notches, each of which produces a new plantlet. This is a specialized form of vegetative reproduction. Other species that reproduce this way include the African violet (Saintpaulia ionantha) and the mother fern (Asplenium bulbiferum).